Yoga Manchester are thrilled to announce details of weekend workshop with Doug Swenson ( older & wiser ; ) brother of David ) in May 2019. Doug began his study of yoga in 1969. 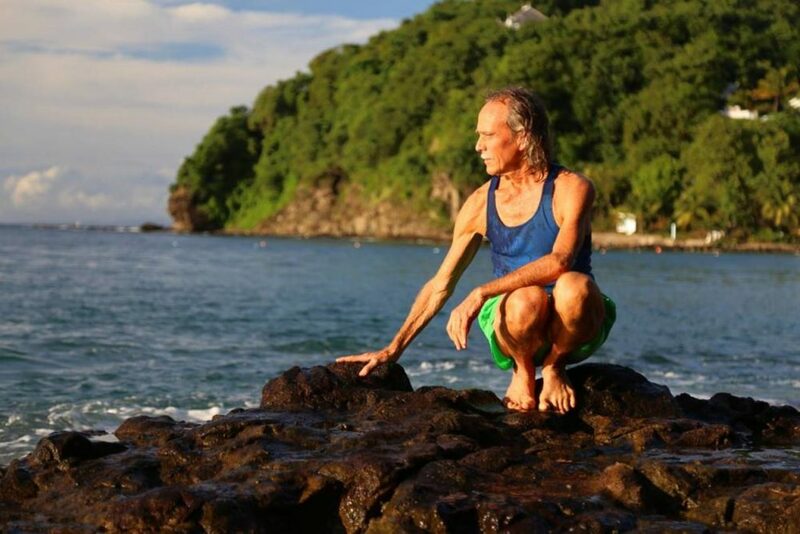 He has had the fortune of studying with many great teachers including Dr. Ernest Wood, K. Pattabhi Jois, David Williams, Nancy Gilgoff, Ramanand Patel, and others.Doug is a master yoga practitioner, philosopher, poet and dedicated health advocate. He has incorporated influences from several different yoga systems along with his passion for nutrition and the environment to develop his unique approach. The main focus of this class is centered on fluid movements of vinyasa and how to expand this philosophy to create flow in your daily life – a variety of yoga postures – both easy and challenging will be used. Explanation will be made as to how the fluid energy lines of vinyasa in your yoga practice can affect your daily life in a positive way. A connection is made to help create awareness of the conscious flow in your daily life using the philosophy of vinyasa to relate to the energy in all aspects of your life. This class is presented with Doug’s own unique Fluid approach to Ashtanga Yoga. This is based on all levels Ashtanga Yoga Format. Class includes yoga adjustments and pranayama. In this class the students will experience a delightful, holistic flow of asana – focused around Handstands, Inversions and balancing in general. Many tips and suggestions will be given as to how we can achieve new poses and refine techniques of existing poses. In addition to priceless advice on how to avoid and overcome injury. This class gives the students a broader vision of anatomy – beyond the muscles and bones. A better understanding and respect for our internal world is established. Based on the Nine Anatomical Systems of the human body – relation to yoga practice and healthy diet. This class will follow the order of asanas for 1st level Ashtanga, with the addition of some poses from 2nd and 3rd blended in at appropriate places in your routine. This class includes hands on adjustments and personal suggestions on how to enhance your practice. Class ends with pranayama, and deep relaxation. In this class we will practice a variety of basic asana – placed mindfully in a balance progression. Some asana will supported by props and held for longer duration of time. Alternately you will move slowly into a few relaxing complementary asana – holding for a shorter duration of time. Class will finish with light and easy pranayama and a blissful guided deep relaxation. Cost: £150 / £125 Early-Bird Price if booked and paid in full by March 1st 2019. Individual sessions £30. Please note when booking individual sessions please ensure you email us with details of which sessions you want to book on. Please note that cancellations within 4 weeks of the event will be subject to a 50 % loss of payment. Total refunds will only be considered in special circumstances. Refunds given outside of the 4 weeks period will be subject to a 20% administration fee. Click here for car parks near the studio. For public transport links click here.